These are crispy fried peanut puffs. 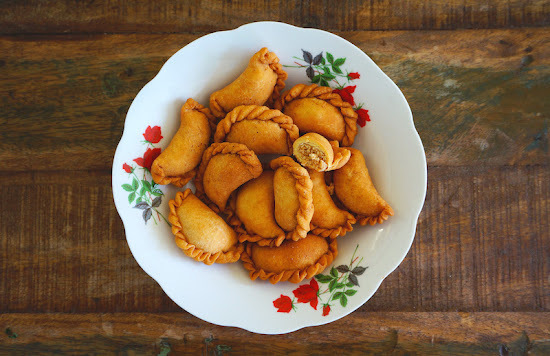 It's a popular snack during festival season in Malaysia, especially Chinese Lunar New Year and Eid al-Fitr or also known as Hari Raya Aidilfitri in Malay. For the filling: Mix all the ingredients and set aside. For the dough/pastry: Combine the cake flour, sea salt , and egg in a mixing bowl. Gradually add the melted butter to the flour and knead well. (If the dough is too dry, add a little extra melted butter at a time) Wrap the dough with plastic wrap and let it rest for about ½ an hour. To make the peanut puffs: Roll out the dough, and cut into 2 1/2 inches circles in diameter. Spoon about 1 1/2 tsp of filling into the center of the pastry, fold over to meet the opposite site and press the edges together to seal. To pleat the edges, flatten one end of the edge, with your finger, pull it out, and then push in the dough forward. Repeat all round the edges until a “rope” is form. Put the oil for deep-frying in a pan or wok over medium heat. Fry the peanut puffs in batches, till golden brown, about 5 to 6 minutes. Drain on kitchen paper and serve at room temperature.